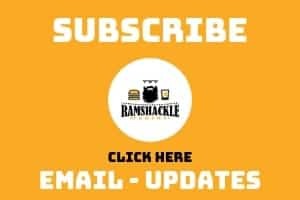 April 16, 2019 (Last Updated: April 4, 2019) - As an Amazon Associate I earn from qualifying purchases. These little candied ginger treats are addictive. 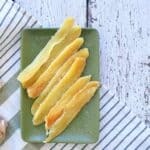 I have been messing with candied ginger for almost a year now and I thought it was about time to share my Candied Ginger recipe. If you like sweets with a kiss of ginger bite, this recipe is going to be for you. This is an easy recipe and you will make some delicious little treats, but be warned that they are going to disappear quickly. 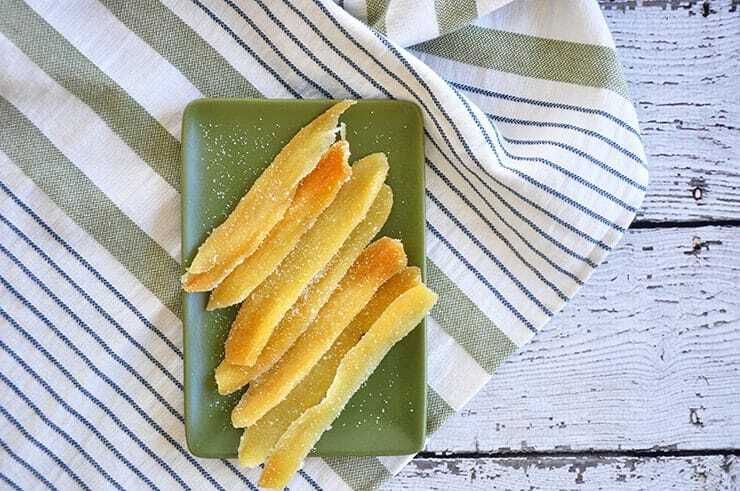 The beauty of this candied ginger recipe is in the simplicity of it. To make this recipe, we take a hunk of peeled ginger and slice it up. Then, let it simmer for a long while with water and sugar. This softens the ginger in such a way that makes it edible and also imparts the sweet syrup into the root. 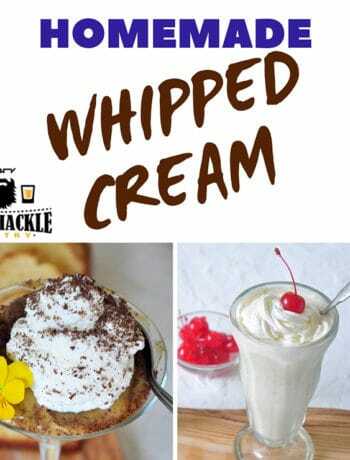 After a final dusting of sugar and a bit of time in the refrigerator, you end up with a delicious sweet treat. This really is a personal choice, but I like to make long, thin strips of ginger. Almost how a typical slice of beef jerky might be cut. I have cut it in small rounds, as well. One of the interesting things about ginger root is the nonconformity of it all. So much of what we find in the produce section today has been genetically messed with so much over the years, that everything conforms to be the same. Ginger, however, is a big knotty mess and I love it. All of the nooks and crannies of the root give it this sort of chaotic feel. This means that the shape of your candied ginger must conform to the ginger you have on hand! You can, however, have a say in what your candied ginger looks like if you start at the grocery store. In shopping for this candied ginger recipe, I look for the hunk of root that is big and looks like has at least one big girthy section that will allow me to get a nice sized ginger piece lengthwise. Then, when I actually cut it, I first peel and then make length cuts so that I have little slabs or planks of ginger. A key to this recipe is to understand that the thicker you cut the ginger, the longer it will take for it to become candied. 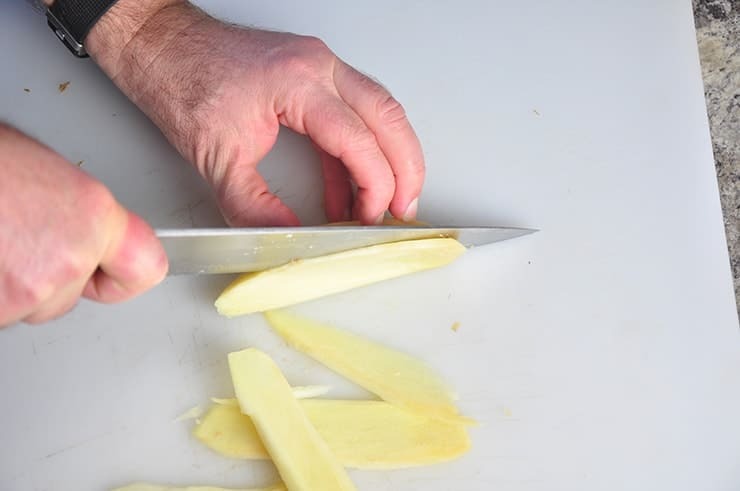 I slice my ginger ¼ inches or less, no matter if you cut it lengthwise or crosscut. Perfect opportunity to make something with a dual use! The ginger syrup that is left behind could be used for a cocktail, a sweetener for tea, or anything that needs a sugar glaze. Once you are done simmering the ginger, we want to get a nice dusting of sugar granules to give it that candied feel. 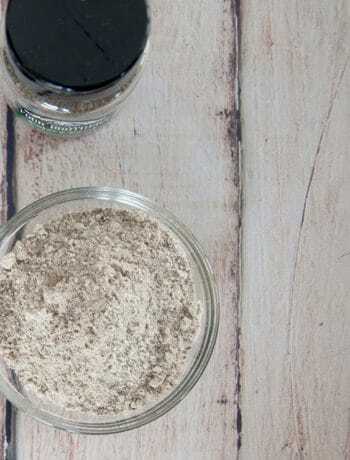 Just add the done ginger to a sealable container with a few tablespoons of sugar, cover, and then shake. Finally, these little treats are best served cold. Place on a paper towel covered plate. If you just put on a plate, there is a chance that the liquid just stays on the plate and doesn’t allow the candied ginger to solidify or form a nice piece of candy. It can just end up being goopy if you don’t allow the ginger to both cool and dry. I am telling you… these don’t last long, but they are so tasty. 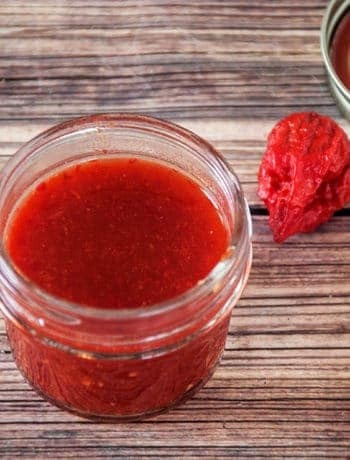 If you enjoy this recipe, let me know! 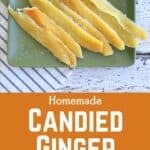 Otherwise, share this Candied Ginger recipe on Pinterest and make sure to subscribe to get updates via email! You will have never seen a candy disappear so fast. 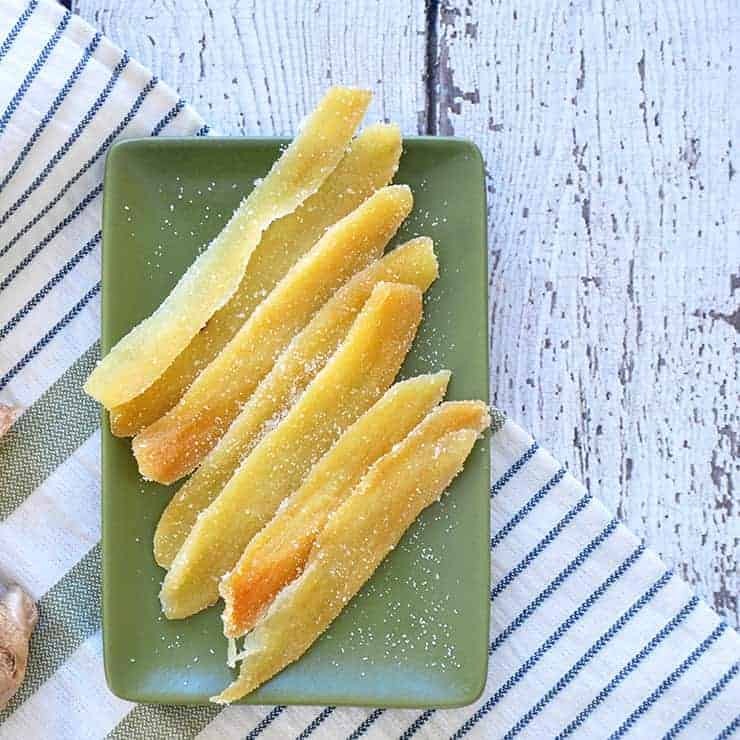 This Candied Ginger recipe is so easy and delicious that you will be racing to your kitchen to make more. Put candied ginger on paper towel lined plate and allow to rest in the refrigerator for 4 hours. Keep in fridge and eat within 1 month. Much of the sugar remains in the syrup and it is hard to determine calories. My ESTIMATE is that each serving (1 ounce) soaks up 2 tablespoons white sugar and is coated with two teaspoons.